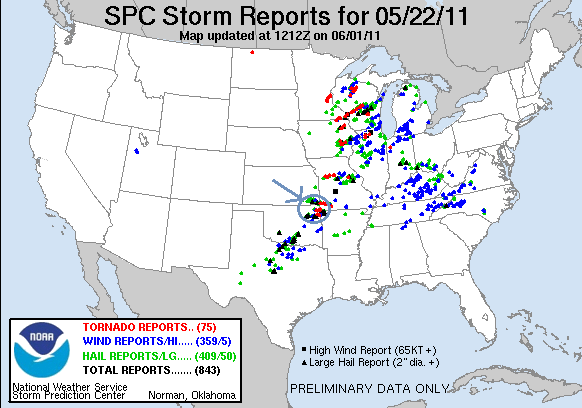 May 22nd, 2011 is a day that no storm chaser is going to forget anytime soon. For me, it was interesting in that the day was mostly a bust until pretty late, and it also marked the first time I’d ever chased in Missouri. Who would know that my brief 2-hour chase experience in that state would include one of the most devastating tornadoes in US history? The day started with us in Wichita, KS, expecting a big day in southeastern Kansas and later into Missouri. Our initial target was Independence, expecting to move on later towards Parsons. The setup was excellent with ample moisture, very high CAPE, and good surface winds. The one problem on the day however was going to be the limited upper level winds. While on the one hand, this can help in that the storms don’t move terribly fast and so are easier to chase, but it also means that the storms aren’t well ventilated: without strong upper level winds, the precipitation doesn’t blow too far away from the updraft, and that is a recipe for high-precipitation supercells. Ultimately this meant that visibility would be tough all day and you’d have to be close to the mesocyclones to see anything, and also that we’d be under rain and hail cores all day. The first storms went up near Independence, KS and we headed north after them. For a time, they were not well organized, and we decided to kill some time by driving into a hail core and playing with the storm near Galesberg. After a bit, we realized that not only were we close to getting clobbered by big hail, we were also in danger of getting out of position on the next storm in line that was becoming the big dog of the day. We rushed out of the core and proceeded to run circles around several cells in the area of Parsons, Oswego, and Altamont. A couple of times the storms generated big wall clouds, but never really looked close to dropping a tornado. One thing they did have however was incredible cloud to ground lightning, and we spent hours in a significant lightning threat with CG’s landing all over the place near us. Between the lightning and the constant precipitation falling out of the cores, we rarely were able to get out of the vans all day. As we continued to chase in the wooded hills, getting almost right under one meso after another, we got a little surprised as one of the cores got more violent than the previous ones and suddenly we were hammered by rock hard golfball and larger sized hail. We abandoned ship and headed east into Webb City, MO then south into Joplin to get south of the cells and refuel. It should be noted that what was about to happen in Joplin occurred when we were not even really chasing. Not that our guards were down, because if they were, I probably wouldn’t be around to write this, but we were sort of at a pause in the chase. We headed into town along Business Route 71, not aware of what had changed to our west: A cell coming north had hit the boundary like all the rest, but this one did not cross the boundary into the cold air. Instead the storm turned right hard and rode right along the boundary towards Joplin, with all of the horizontal vorticity along the boundary available as fuel for the storm. We headed down BR 71 and found a gas station to stop of and refuel, and those who really needed to use the facilities were allowed out as it had been a long while since we’d taken a break. Fortunately as it happened, the attendants at the store would neither allow folks in, nor allow us to pump gas, because we were under a tornado warning. Of course, we’d been under tornado warnings for hours, so we were not overly fazed; after all, we are always in tornado warned areas when chasing. As we mounted back up, Roger took a look at the radar and screamed “Holy $%^!! We got a tornado coming right at us, everyone back in the vans, we gotta get south NOW! !” We piled in and hit the road in a hurry. Unfortunately, there was very heavy traffic on the road, and traffic lights every block, so progress was very slow and the situation became more and more serious. We needed to get to Interstate 44 to get east and out in front of it. You could see the highway down the road about ½ a mile, but progress was painfully slow. Soon off in the distance as the dark black cloud neared, guests started seeing one power flash after another, getting closer and closer (right about this time was probably when the hospital was hit). We started hammering on the horn and weaving through traffic as best we could, as the guests were yelling out the windows to people aimlessly driving, or even strolling along the sidewalk north into the path, to take cover immediately! Then, another stop light and we were stuck. Panic was starting to set in and we discussed possibly driving out behind the Home Depot for shelter before quickly dismissing the idea because it would be too close to the tornado. We pressed on. The Home Depot was destroyed completely, with many fatalities. It was beginning to look like we were in big trouble when suddenly the power went out, including the traffic lights. We were moving again! We started weaving around traffic and charging towards the on ramp only a hundred yards or so away. Then from my right, I saw the wrapping rain curtains coming over us. We were in the outer rotation under the mesocyclone. By now the guests were all screaming because they could see power flashes only a block or two away, and some captured the east wall of the large wedge tornado on video. Suddenly we were blasted by wind and rain as we got to the ramp. The next minute or so was the most scary I’ve had chasing. The on-ramp exited to the right, meaning we turned directly INTO the rotation as we swung around to the east. As I charged up the ramp I turned as hard as I could as we were being thrashed with wind and rain and debris was flying overhead in the rain curtains. At the top of the ramp, the car in front of me stopped!!! I hammered the horn over and over and was considering whether I should literally bump him out of the way when he finally moved and we zoomed east on the highway. The highway however traveled northeast out into the path of the tornado. We made it to the next off-ramp maybe ½ a mile along and jumped off south on Rte. 71. Many tractor trailers were flipped and destroyed on the Interstate just up the road. We screamed south several miles until we were well clear of the hook, and then stopped to collect ourselves. Everyone was completely rattled by what had happened, but nobody really knew the magnitude of what was going on, and while we knew it was a strong tornado, nobody expected anything like an EF-5, the strongest tornado rating possible. Only after stopping for a few minutes did we start hearing reports of heavy damage and as we headed south we noted many emergency vehicles heading north towards Joplin. It would be well into the evening before we understood the true magnitude of the disaster that had occurred. 1. The gas station refusing us service. If they had, we very likely would have been run over by the tornado before we could escape. 2. The decision not to shelter at Home Depot. As stated above, the Home Depot was completely destroyed. 3. The power going out, taking the traffic lights down. If not, I’m not sure we could have gotten moving fast enough to get out. We headed south to Neosho, finally stopping for fuel. At this point the terrain got really horrible, with dense groupings of trees and the roads were like roller-coasters, up and down the valleys around the Neosho River. At the bottom of these valleys, visibility was essentially nothing, and another tornadic supercell with a known tornado was coming upon us. We blasted south on Rt. 43 from Seneca through the precipitation core in awful chase terrain, all the way south of Southwest City. We realized we were far south of the hook and turned around, heading back through the town and then north into the woods. I have to admit at this point that I was more inching forward than charging forward. The tornado which turned out to be another big wedge, had been plowing through the woods for quite a while, and as we crept northward tree debris was falling out of the sky all around us. Eventually we saw it in the distance as it passed, a rain wrapped ghostly cone with suction vortices dancing along the trees as it went by. After finishing with that storm, there was yet another tornado warned storm to our south, and of we headed down Rt. 59 into Arkansas, my first time in that state. As we reached Siloam Springs, it was just about dark, and the hook of the storm was just to our west. We stopped in a parking lot to observe in the dark in the pouring rain. We soon figured out that we’d never see anything from where we were and got back on the road west into West Siloam Springs across the state line into Oklahoma. As we did, something loomed in the lightning illuminated storm. Another flash confirmed it, a big stovepipe tornado crossing the road a mile or two ahead of us! We stopped as the tornado passed to our north and dissipated, then as we got closer we observed a gray-white funnel halfway to the ground near the road. We headed west and drove into the damage path: Insulation and roofing all over the road, sheet metal and wood all over the place. I later learned that the tornado had hit an RV park, destroying 6 or 7 of them and sending a few people to the hospital, but fortunately there were no fatalities. We finally called it a night after that, but had one more surprise in store. As we entered Tulsa where our hotel for the night was, we ran into a big hail core from another storm that had just popped up to the southwest. It was on top of us before we knew it and soon we were getting hammered with huge hail! I witnessed two hail stones of at least tennis ball size slam into my windshield, which literally bowed with the force but somehow did not shatter! Then off to our left KABOOM! A bright blue flash and the power went out over the entire southern part of Tulsa. A power main must have been damaged by hail is all we can guess, but of course with everyone jittery from Joplin, people were worried about a rain-wrapped tornado. In only a few seconds, the power was back on and we finally got to the hotel, ending a long, dramatic chase day. Mileage on the day was 522 miles, but it seemed like an eternity. A chase I will never forget. I put together a graphic of the path we took during our escape relative to the tornado's damage path. We actually crossed the damage path twice! Here are several links to video from guests on the tour.